No one with some knowledge about the present-day press will think that the pictures of Sophie are how she is in person. But since pictures of both Sophie and Kate are heavily photoshopped, it is possible to make a comparison. And Sophie looks her age while Kate looks a lot older than her age. Not 50 like Sophie, but if I would see a picture of Kate not knowing who she is and someone would say she is close to 40, I would believe it in a heartbeat. ^^^^ Actually, no, more like this one as its a close up. Of course Sophie has wrinkles and lines, but she doesn't look scary. Kate looks scary and if I didn't know her I'd put her between 42-45 and no less. I've seen better skin on faces and necks of 55 year olds. I work with portraits in Photoshop and kate is bad bad for her age. Sophie, nope, she's not doing great either but I like the woman's softer appearance even if she had double the wrinkles - her eyes are kind whereas Kate's are hard, calculating, and yes, at times miserable from the bed she now has to lie in - the bed she made for herself. My grandmother always said by 30 we start wearing our inside on our face - I think she's right. She still looks lovely, and still looking good for 50 even without photoshopping. Wasty has looked a mess for several years now. Compared to some of the hairstyles of Queen Maxima, this is pretty decent. At least she has tied it down behind her head. And BTW plenty of women above 25 wear it like this, including f.e. 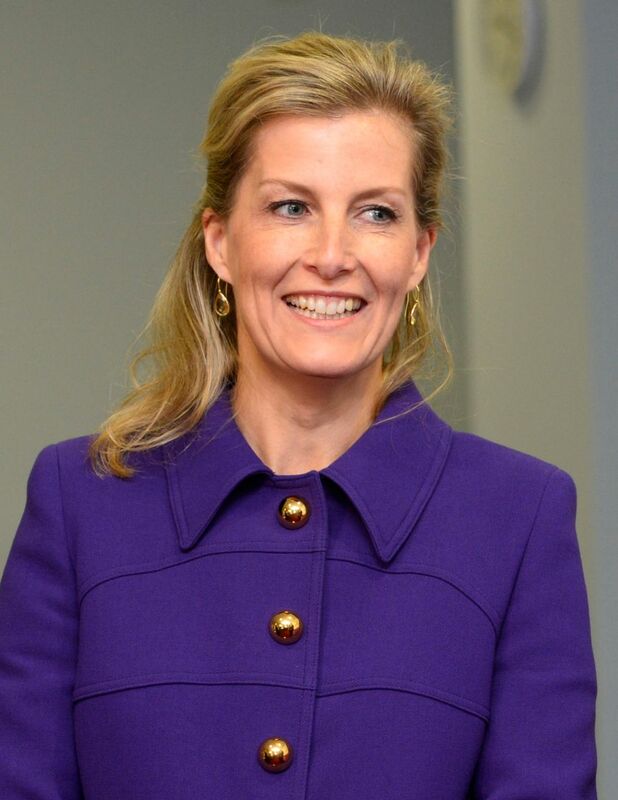 the very royal born Infanta Elena of Spain, sister of the King and the equally royal-born Princess Astrid of Belgium (sister of the Belgian King). Maxima is very much her own person and has the big personality to pull off her faux pas. Elena's hair looks bad, too. No one should copy her. I'm not familiar with Princess Astrid, but the photos of her I pulled up online show her to have a hairdo just below the ears, so that is not comparable to what Sophie is trying to pull off. Sophie NEEDS to go back to shorter hair. Now Queen Noor of Jordan had beautiful thick hair that looked good in the hairstyle Sophie is trying to do. It worked for Noor. Does not for Sophie. I really am not trying to compare Sophie to anyone [of course I do think she's trying to copy Kate]. I just want to compare Sophie with Sophie. And her hair is a hot mess. It's too thin, too dry. Her continuing to pull it back in a fake bun, ponytail and now this Kate style, draws attention to her receding hairline. Sophie did not look good with the very short hair (from the years she was copying Diana) and she does not look good with long hair (now that she is trying to copy Kate). She looked the best when her hair was mid-length. It is a shame that she is not confident enough to be herself. Personally I think Sophie looks nice and I understand her problems with hair. My hair is also very thin (although my hair has more shine to it, but that can also be the result of Sophie being 9 years my senior) and nothing works: long hair, short hair, in the middle. I can use all the produce, all the blow drying but within minutes it is a life-less and without volume. So I often use the same hairstyle of Sophie to keep it out of my eyes and to avoid that I have to wipe it away. Sometimes I do it up, but this is rather time-consuming and it will never be very good when you do it yourself, the bun will always be a bit crooked, not at the center etc. And I think Sophie has the same problem. Sure, she could hire a hairdresser to do it for her every time she has official business but if she would do that many people would find fault in that as well. As for Sophie trying to copy Kate...I am not buying it. Sophie has been involved with neo-natal care since forever (the result of course of the difficult start for Lady Louise, bringing the subject very close to home) and she seems much more secure in her life than Kate. Whenever I see Edward and Sophie together I get the idea that they have a good thing going, if they still love eachother...I don't know, but they seem to be more comfortable with eachother than William and Kate. 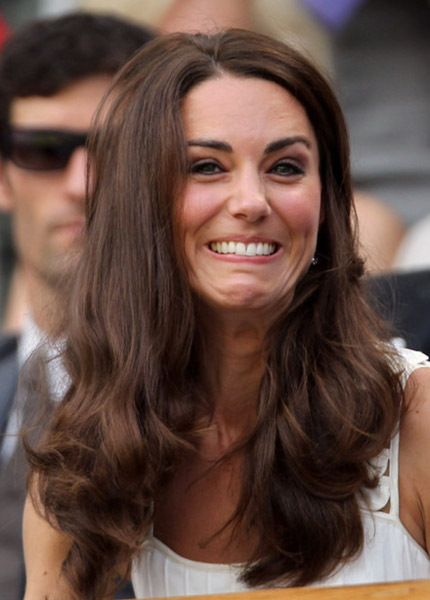 Kate sometimes looks afraid of William and who would want to be married to a man and be scared of him? And, and this is my personal idea, why would you want to trade places with the wife of the heir to the heir? I think that when it comes to having a nice life, some sense of privacy, some freedom to decide what to do, Edward and Sophie have a much nicer life than William and Kate (or Charles and Camilla for that matter). Not that I was ever in the position to choose, but had I been, I would always opt for a younger son of a monarch and not the heir. Let's just be grateful that Sophie isn't glueing yak hair to her head like Wasty. I see nothing wrong with Sophie's hairstyle. ^ But Sophie HAS glued yak hair to herself. Remember the shiny synthetic head she sported at the Fashion College? That ain't her natural hair on her head! This is her real hair: http://3.bp.blogspot.com/-dQmQ-KXAaJg/VDefYpITqsI/AAAAAAAADU8/_nWOZwfMDtY/s1600/Countess-of-Wessex-4.jpg Thin and receding. She needs to trim and layer. So when she has her own hair loose (since it is not long enough to make a bun of it), you feel she looks like a mess. And when she uses temporary extensions so it is long enough to put it up, you ridicule her as well. Damned if she does, damned if she doesn't. I get the feeling you have the hots for Eddie and are just besides yourself with jealousy that she 'stole' your spot. ^I feel that since her own hair is not healthy enough and thick enough to wear shoulder length or in a bun or ponytail or a chignon, then she needs to hire a stylist -- she can afford to -- to cut her hair in an appropriate and flattering style. That's easy enough. Millions of women around the world do this all the time. I also feel that Kate is attacked mercilessly on numerous royal forums for her hair and extensions and inappropriate clothing, and it bothers my sense of fair play that Sophie not only is NOT criticized for doing the exact same thing but is praised and called lovely and stylish. I'm not a Kate fan and think William should have left her dumped in 2007, but fair is fair. The least negative thing about Sophie is how she dressed usually. She looks adequate most of the time. The only time I remember she looking totally idiotic was in a remembrance day when she used an ascot hat that looked totally out of place. Though when Kate married in Sophie tried to be a lot more fashion forward which kinda failed. I am all for equality, that is why I am so p*ssed sometimes when there appears to be a different set of rules for royal-born ladies and the commoner-born-but-married-to-royalty ladies. As for Sophie, she isn't perfect (who is?) and she had her flaws and mistakes like the interview with the sheikh, but in my opinion she has redeemed herself since by working (relatively) hard. 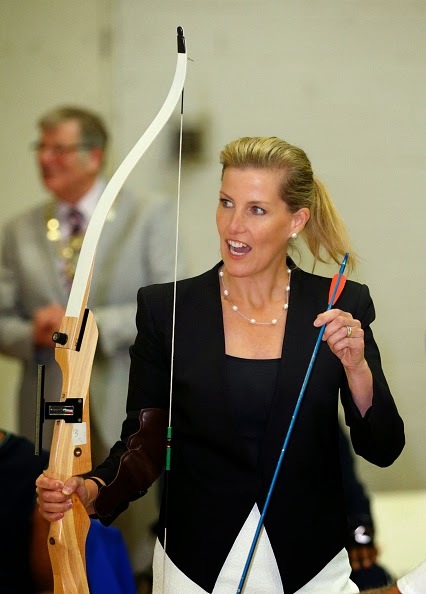 She is patron of many organisations. And when she visits events of 'her' organisations, she seems committed and interested in what she hears. And she is not afraid to show her emotions, like when she opened a new wing for neonatology at the hospital where Lady Louise was born and were Sophie herself almost died during the childbirth. Her words were warm and her emotion was real and that really struck a nerve with me. With Kate I often have the idea that she is calculative, always thinking how whatever she does is perceived by the press and the public. As a result Kate comes across (to me) as cold and calculating and that is perhaps why I am willing to cut Sophie some slack and be extra critical towards Kate. And there is of course the different situation of both ladies; Kate has a higher profile and her actions have a bigger impact on the monarchy than Sophie's actions. Both now and in the future. And in that respect Kate is definitely dropping the ball. I think Sophie is making an effort to look nice so she continues to capture her husband's eye- not to compete with Wasty. Sophie looking like a million, she and Edward still have a husband/wife spark going on as opposed to Wimpo and Waity. ^I think Ed and Soph are pals and companions, but I've never seen a spark or chemistry about them. They're rarely looking at each other in photos, as in this one. Ed is looking out in the water. Sophie is turned just so, trying to pretend to not be conscious of the camera trained on her drooping bosom. Sophie and Edward do a fine job of representing the Uk. They are an asset as opposed to William and The Stalker. Who knows what the story is between her and ED - at this stage in a marriage being good friends is often enough and they clearly are companionable and good friends - they seem to communicate well and treat each other respectfully. I'd say they look like a nice family. Yes Sophie and Edward appear to get on very well, and to be good parents to their two children. Who knows what a marriage is really like apart from the two people involved. So long as they both continue on, performing the duties and engagements asked of them and cause no disruptions within the royal family, that's all that can be asked. I think they're both resigned to being regarded as minor royals by the Press and public, however well Sophie gets on with the Queen. The new generation, Kate, Will, Harry and, to a lesser extent, Beatrice and Eugenie, gobble up the major portion of publicity available. Apparently Charles gets frustrated that his charities don't receive enough public notice. Never boring and always suitable for the occasion. I also like the formal wear, mature but still feminine.